Being able to monitor and maintain your RODI system is almost a necessity to know when your filters need service and if a problem does arise, having a pressure gauge and TDS meter makes troubleshooting much easier. The TDS meter will let you know when your DI resin is fully exhausted so you are not relying on color change alone anymore. Sufficient PSI is very important for the correct operation of a reverse osmosis unit. Low water pressure is a leading cause of poor RO system performance. A pressure gauge assures that proper pressure is being supplied. It will also make pressure drops apparent which can tell you that sediment and carbon blocks need to be changed. Glycerin filled pressure gauges absorb vibration and pressure spikes increasing service life. 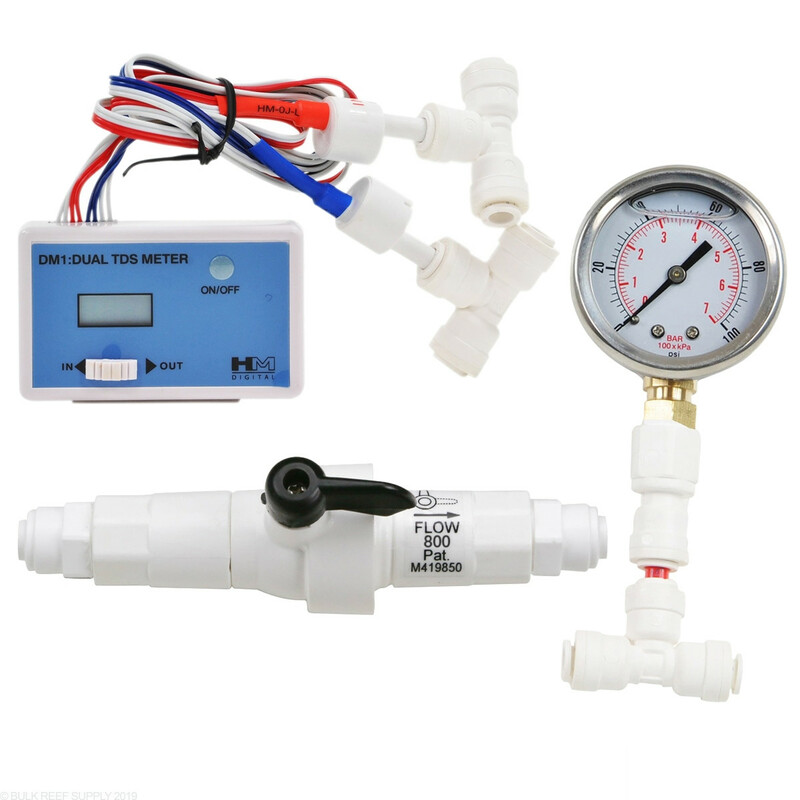 This glycerin filled pressure gauge comes assembled with 1/4" quick connect fittings for quick easy installation in-line before the RO Membrane. This item is designed for use with our saltwater aquarium line of RO systems. The DM-1 Dual Inline TDS Meter from HM Digital is one of the most important reverse osmosis accessories. This tool monitors the TDS of your reverse osmosis system in two places and lets you know exactly how the system is performing. BulkReefSupply.com suggests installing the dual TDS meter post membrane and post DI stage. These two readings will notify you when it's time to change the RO membrane and DI resin. This unit features a digital display and comes with two 1/4" John Guest Quick Connect Tee's. Reverse Osmosis membrane flush/flow restrictor valves increase the flow to the membrane by bypassing the flow restrictor when the valve is opened. This helps flush deposits and significantly increases the usable life of the RO membrane. The Membrane Flush/Flow restrictor valve is an all in one flow restrictor equipped with a flush valve for easy worry-free use. Keeping the flush and flow restrictor in a single package keeps the number of connection points to a minimum which means less chance for possible leaks or failures down the line. 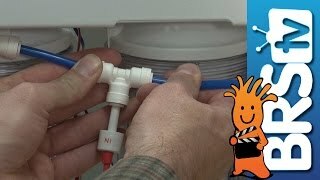 BulkReefSupply.com recommends flushing the membrane before and after each use for a few seconds, or every few weeks for a few minutes as part of regular reverse osmosis system maintenance. When the handle on the valve is “in line” the valve is bypassing the flow restrictor and is in “flush mode,” if the handle is perpendicular to the valve, then the unit is ready for normal use.